Before you know it, all of the sudden it's September. Vacation time is over, the kids are back at school, and Fall inches closer and closer. When the Summer turns into Fall we all unanimously think, "Where the heck did the Summer go!?" What that really translates to is, "Where did all of my time go!?" Just like every other time of the year, and this one is no different, you may be one of those people who always find yourself falling behind on decorating or any seasonal preparation. There's no need to worry! You still have all of September and early October to get started; but you don't want to wait until the very last moment. If you definitely want to decorate for the Fall, don't want to spend a fortune or stress yourself out rushing around last minute, then there's really only one easy solution... Keep it simple! Slow and steady wins the race, simple and stress-free keeps your grace! Your Fall decorating dilemmas will be no more! We have five incredibly simple, classic, ideas (with a twist) to turn your home into a Fall Wonderland (we'll also show you some of our favorite creations)! Favorite Creation: Now this little guy is a bit unconventional from the typical scarecrow. When those creative juices are flowing it's amazing what you can come up with! The itty-bitty Terracotta Scarecrow below is a great, simple, DIY project for you and the kids. He's kind of cute too! Next, Pumpkins and Gourds. When you think, "Fall" or "Autumn," what's the first thing that comes to mind? If you guessed Pumpkin Spice Lattes you're not entirely wrong, but that's close enough! During the Fall, everyone has pumpkins and gourds! Your parents, grandparents, co-workers, neighbors, your best friend's older brother's friend's cousin! They all have the staple ingredients to the Fall season right outside their front door! Now let me ask you something? Is it really Summer without the Sun? Not at all. So is it really Fall without pumpkins? Definitely not! All you have to do is find where you feel they look best, plop them on the ground, and enjoy! It's as easy as pie... eating pie that is (hopefully pumpkin pie). Pumpkins and Gourds, no matter their size, shape or color will always brighten up your Fall days and hopefully inspire some clever ideas! 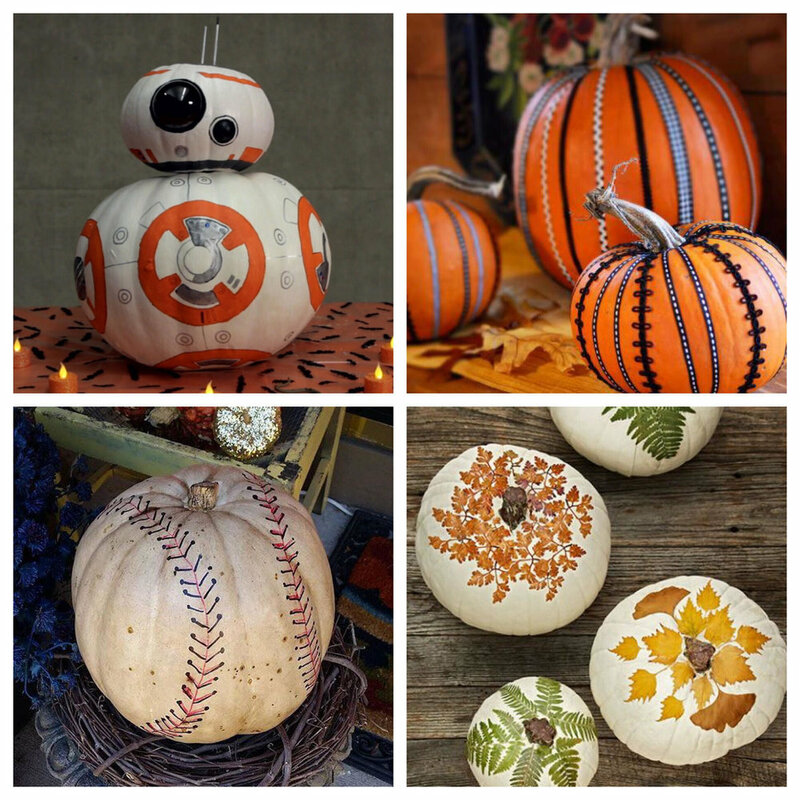 Favorite Creation: Do you like to carve and decorate pumpkins? If so, let's step it up a notch! This compilation of photos below is truly nothing short of brilliance. If they can show off their creative prowess, why can't you! No matter if you're looking for a new age sci-fi look, contemporary, sports, or nature theme for home this year, there's a lot to choose from. That's what makes Fall so great! Corn Stalks, corn plants, stalks of corn, Hokoleskwa; whatever you want to call them! Yes, I said Hokoleskwa... Quick history lesson: Prior to the American Revolution there was an Indian Chief of the Shawnee Nation that went by this name. What does his name mean? Well, believe it or not it loosely translates to, "stalk of corn." Enough history for today, let's talk about how you can use corn stalks to decorate your home. If you can fit them in your car, corn stalks are really something that will spice up your home for the Fall. They're great for entrance ways, light, fence and mailbox posts, or even lining the sides of your house. Tie them up with twine or even some decorative ribbon to give it that extra hmph, and you'll be rollin' in the Fall spirit! For those who want to go above and beyond... have you ever considered making your own corn maze? It's just a thought but, hey, we're keeping it simple here! Favorite Creation: I mentioned that corn stalks look great around light posts, but have you ever considered the thought of putting lights on the corn stalks themselves? Think of it as the Christmas tree of the Fall! As night time begins earlier and earlier everyday now before daylight savings, this illuminated corn stalk will allow you to enjoy them 24/7! Favorite Creation: There is just simply too much greatness to choose from. To see some amazing creations check out what people have done at The Lettered Cottage. It's a difficult choice, but this one is for the dog lovers out there! I couldn't pass this one up. This is Hay, Mr. Bale's fur-ball friend! This hay bale doggy is probably causing some mischief while Mr. Bale is reading this blog to get ideas for his Fall decorating! Lastly, and no I didn't forget the infamous Mums, Cabbage and Kale. You can never go wrong with any assortment of this botanical trio! They are quintessential to Fall just the same as the falling leaves and apple cider donuts. Between the ease of planting, the vibrant colors of a mum and the contrast of kale/cabbage, your Fall decorating will be easy, beautiful and stress-free (if you don't drive yourself mad picking out colors)! Favorite Creation: It's always a great thing to be creative, in fact, it's encouraged; but why stray away from the classics if they work so well? It's no knock at your talent or creativity by any means. All that matters is what makes you happy and brings that tear to your eye! Take in the beauty of your home and confidently say, "I live here!" Bonus: Two words: Pallet Displays. Try it out for yourself, it's a real eye-popper! Here's our very own creation!